Have to go with a Weird Menace pulp on the day before Halloween. This issue of DIME MYSTERY features a cover by Tom Lovell and stories by several masters of the genre, including Norvell Page, John H. Knox, Paul Ernst, and Wayne Rogers. Pretty spooky stuff, I imagine. 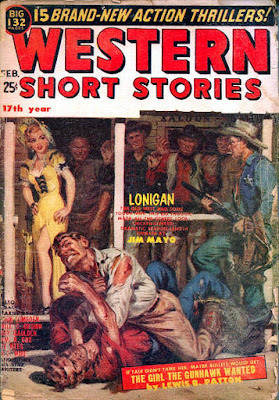 This issue of WESTERN SHORT STORIES starts off with a Norman Saunders cover, and inside are stories by some of the top Western authors ever: Louis L'Amour (writing as Jim Mayo; this is one of the few L'Amour stories I remember seeing outside of a Thrilling Group pulp), Lewis B. Patten, John Jakes, Wayne D. Overholser, Ray Gaulden, Will C. Brown (the other writer from Cross Plains), William R. Cox, Joseph Payne Brennan, H.C. Wire, and more. This is one of the Stadium Publishing pulps, which are not that highly thought of, but it would be hard to beat that lineup for what was regarded as a salvage market. 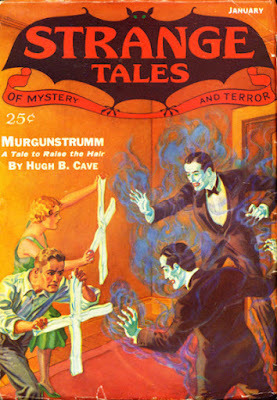 I usually try to read something creepy for the Friday closest to Halloween, and Hugh B. Cave's novella MURGUNSTRUMM certainly qualifies. It's arguably Cave's most famous story, has been reprinted numerous times, and serves as the lead story in the World Fantasy Award-winning collection MURGUNSTRUMM AND OTHERS. 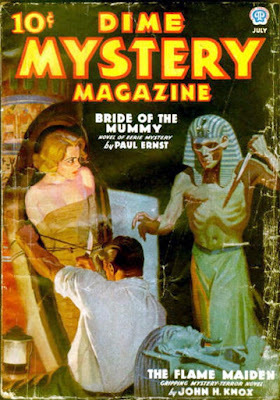 Originally published in the January 1933 issue of the pulp STRANGE TALES OF MYSTERY AND TERROR, with a cover by H.W. Wesso based on the story, MURGUNSTRUMM is different right from the start. It begins after the point when most horror stories from that era end, with the protagonist, Paul Hill, locked away in an insane asylum because he's witnessed something so hideous, so horrifying, that it's blasted his mind to bits. Or has it? Unlike the largely ineffectual protagonists in stories by other famous authors (*cough* Lovecraft *cough*), Paul knows that, yeah, he's seen something pretty bad, but he's not nuts, and more importantly to him, neither is his fianceé Ruth, who has also been committed to an asylum. And he's going to do something about it. With the help of Ruth's brother, he escapes, then sets off to the small backwoods town of Rehobeth, near the Gray Toad Inn, where the dreadful incident that resulted in their being committed took place. Taking along his future father-in-law's husky chauffeur, he lures the two doctors who signed the commitment papers to the village, takes them prisoner, and forces them to accompany him to the sinister inn, which is run by the deformed title character, Murgunstrumm. Paul's plan is to force the doctors to see that he and Ruth aren't crazy, so they'll have to intercede and get her released. But once they get inside the inn, they can't get out again, and then bad things happen . . . The pace never really lets up for very long in this yarn, and the atmosphere is hot, sweaty, and terrifying from beginning to end. MURGUNSTRUMM is pure blood and thunder, as grotesque as many a more modern yarn, and to my mind, at least, even better because it also has that wonderful headlong sense of pulp action. I haven't read the rest of the collection yet, but I know it's good because Cave never disappoints. He was one of those rare authors who could write anything, and write all of it extremely well. If you're looking for a great horror tale to read on Halloween, look no further than MURGUNSTRUMM. We went and voted this morning. No line, just walked right in and got down to business. The first presidential election I voted in was 1972, and I've missed only one of them since then. I thought seriously about skipping this one, but there's also a local bond issue on the ballot I actually wanted to vote on. My parents took the concept of a secret ballot very seriously. When I was growing up, my dad might make an occasional comment that might give you a hint of who he was going to vote for, but it would just be a guess. I don't recall my mother ever making a political comment. And if you asked them outright, they wouldn't tell you who they voted for. It was nobody else's business. Nor would they even think of asking someone else who they voted for. It was none of their business. I've tried to follow their example. So I hope all of you who are eligible go and vote, if you haven't already. But who you vote for is none of my business. 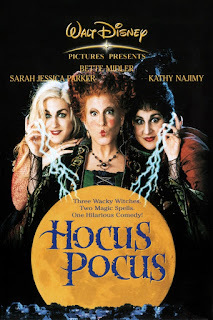 I'm not sure why we never saw this movie when it came out in 1993, but with Halloween less than a week away, it seemed like a good time to watch it. It's a nice little horror comedy, less cute and whimsical than you might think. Bette Midler, Sarah Jessica Parker, and Kathy Najimy (who seems at times to be channeling Lou Costello) play three witch sisters who are hanged in Salem back in 1693. But of course there's a way for them to come back to life, which they do in 1993. They're actually pretty evil. Things never get too creepy, though; this was marketed as a family-friendly movie, after all, although to me it seems a little dark for that. Nor is it a great film, by any standard. Midler, Parker, and Najimy chew the scenery relentlessly, and the script provides some good action but not many laughs. The movie looks great, though. It might have been better as a straight horror thriller. As is, it's a pleasant enough way to spend a couple of hours and just spooky enough to be effective at this time of year. Hanged twice, but still . . . undead. Vincent Bayonne’s luck may have run out at last. 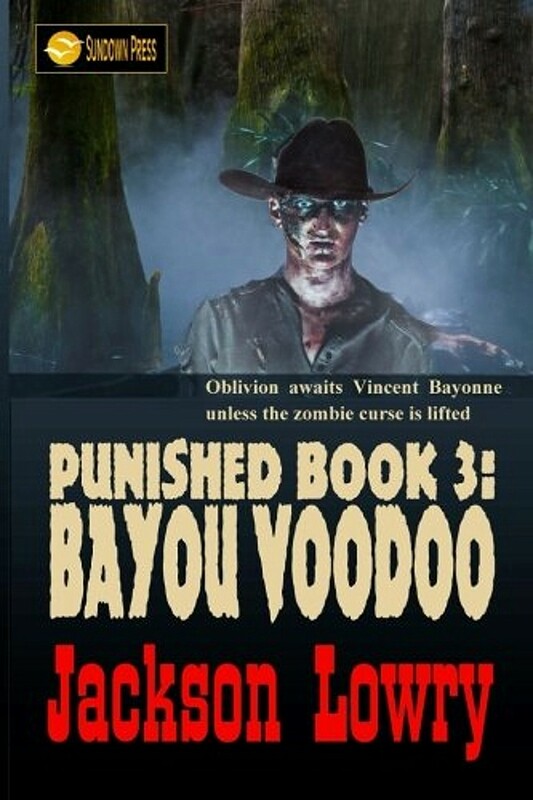 The former plantation owner must find William, the freed slave who placed the zombie curse on him, if he wants to avoid the unholy fate of a living death. 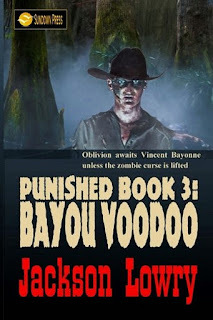 To reach William in New Orleans, he makes his perilous way across the untamed American frontier while escaping from US Army patrols, dodging lawmen and railroad detectives after the reward on his head, and trying not to get killed by those who hate him because of his cruel rule over Dark Oaks Plantation. Bayonne's quest for revenge is now a fight for sheer survival. The medicine he needs to hold back the slow coarsening of his body and mind, turning him into a zombie, is long gone. His only hope is to find William, and to do that he must first get Marie Laveau, Voodoo Queen of New Orleans, to befriend him. His only allies are a beautiful woman from his past and his own incredible strength while under the curse. With the choice of becoming totally undead or begging those he hates most for aid, Bayonne plunges into the darkest recesses of black magic, hoping for a cure—and redemption. Yep, that's Pulitzer Prize-winning poet Carl Sandburg his own self appearing in a pulp magazine. Of course, BLUE BOOK wasn't really a typical pulp magazine, and not only because it reprinted a number of Sandburg's poems. 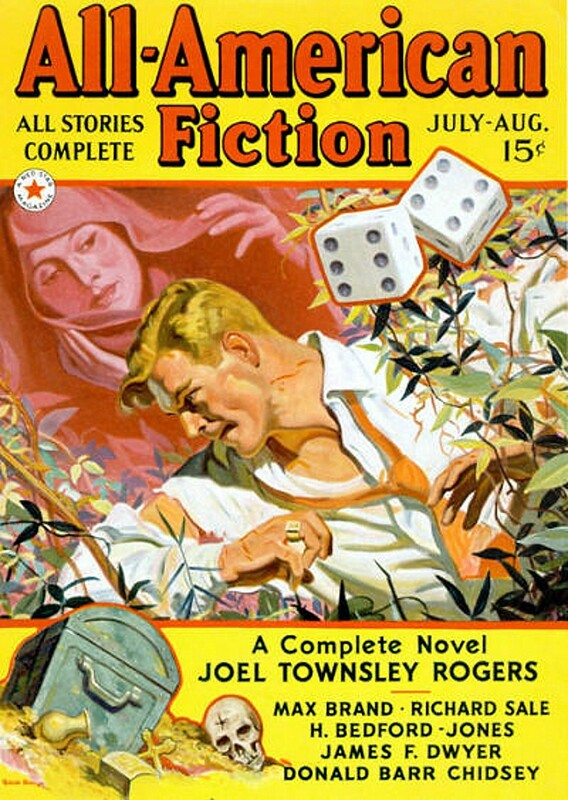 This looks like a fine issue with an Arms and Men story by H. Bedford-Jones, part of a Kioga serial by William L. Chester, a Tiny David story by Robert R. Mill, and other stories by Leland Jamieson, Fulton Grant, Richard Howells Watkins, James Francis Dwyer, and others. It's generally hard to beat the line-up of authors in any issue of BLUE BOOK, and that's certainly true here. 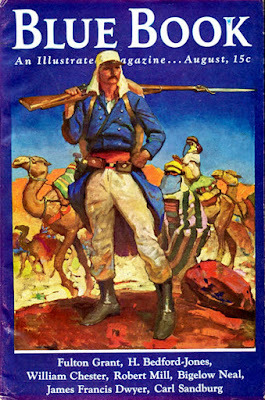 Plus a good Foreign Legion cover by Herbert Morton Stoops, who provided top-notch covers month after month. Traveling by stagecoach must have been really dangerous. They're always getting chased by owlhoots! 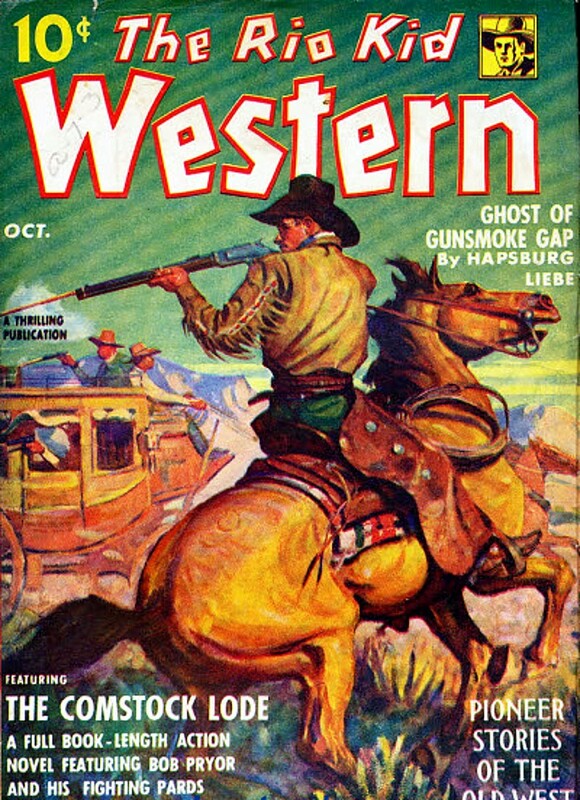 Inside this issue of the legendary pulp WESTERN STORY are two stories by Frederick Faust, one as by George Owen Baxter and one under his John Frederick pseudonym. Also present are popular author Jackson Gregory (with the first part of a serial) and lesser known writers Kenneth Gilbert, E.C. Lincoln, and Joseph F. Hook. I'm always in the market for a good Mountie yarn, so when I came across a copy of THE LONG ARM OF THE MOUNTED, published by Macaulay in 1926, at Half Price Books, I bought it even though I wasn't familiar with the author, James French Dorrance. Even after more than fifty years of reading pulps, and reading about pulps, from time to time I still run across an author from that era who's new to me. 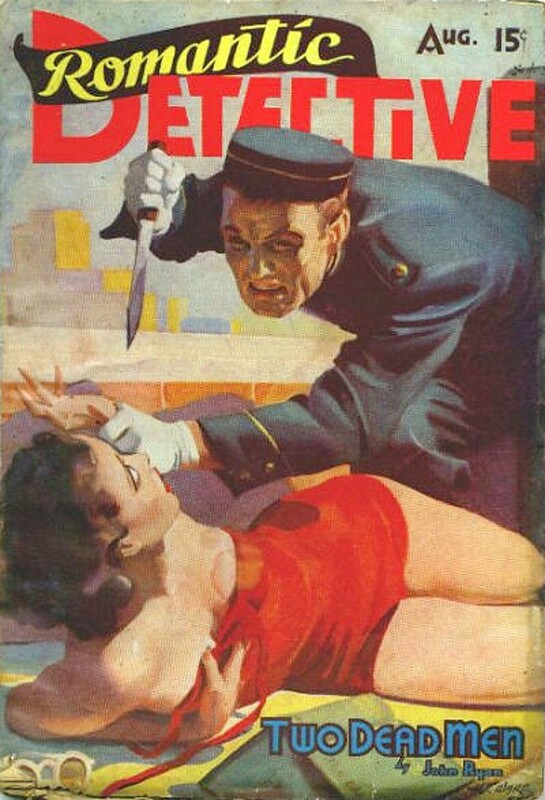 Such is the case with Dorrance, who produced dozens of stories for the pulps during the first three decades of the Twentieth Century along with a number of novels, many of them Northerns with protagonists from the Royal Canadian Mounted Police. This novel is actually more Western than Northern, because the hero, RCMP Sergeant John Childress, is working undercover for practically the entire book, pretending to be a horse rancher just across the border from Montana. Rustlers from the States have been crossing to border to raid the herds of the Canadian ranchers in the area, and it's Childress's assignment to break up the gang and bring its leader to justice. That job is complicated by a couple of beautiful young women, one the daughter of the rancher just west of the spread Childress takes over, the other the young widow who owns the ranch to the east. Both of them fall for Childress, he's torn between them, and that romantic triangle takes up a considerable portion of the book. Childress never completely loses sight of his assignment, though, and eventually he uncovers the hidden mastermind behind the rustling (whose identity will come as no surprise to anybody who's ever read many Westerns). 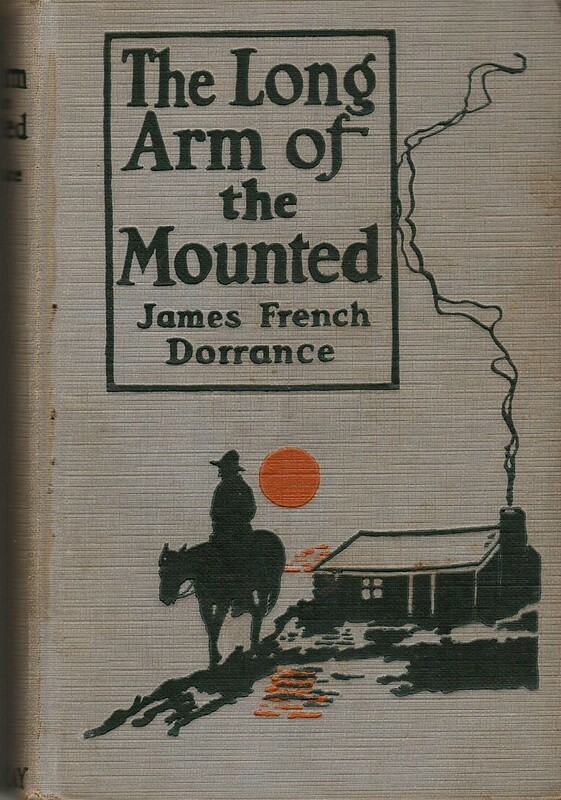 Dorrance's writing style is on the old-fashioned side, as you'd expect from a book published ninety years ago, and to be honest, this novel could have used a little more action. The story flows along pretty well, though, and there are a couple of nice slam-bang scenes late in the game. Dorrance wastes an opportunity for an even better climax, however, giving the reader a rather limp ending instead. All that said, I enjoyed the book quite a bit. I like putting myself in the mindset of readers from previous eras, as should be obvious from all the old books I read. I can see why Dorrance wasn't a big name but also why he had a fairly long and productive career. THE LONG ARM OF THE MOUNTED is a mild but pleasant diversion from real life. These days, most of the time I'll take that and be grateful for it. Husband-and-wife gunfighters J.D. and Kate Blaze are just about the unlikeliest Santa Claus and Santa’s helper that the Old West has ever seen. But when a bank is robbed in Arizona Territory and a frantic mother has to embark on a desperate journey to save her son’s life, it’s Kate and J.D. who ride along to make sure everybody gets what’s coming to them for Christmas, whether it’s a hangman’s noose or hot lead! By horseback, stagecoach, and train, it’s up to the Blazes to deliver presents for one and all, and there’ll be outlaws and Apaches stirring before Christmas morning dawns. BLAZE! THE CHRISTMAS JOURNEY is a Special Holiday Edition from series creator Stephen Mertz, full of action and humor and heartwarming plot twists. It’s Christmas in the Old West with the deadliest pair of gunfighters to ever hit the trail! Those of us who are friends with Ed Gorman knew this day was coming, but that doesn't make the news of his passing any easier to take. I've had many wonderful friends in the writing business over the years, but only a handful I can say are truly like family to me, and Ed was one of those. Ed was a wonderful writer, of course. Anybody who's read his work knows that. But he was an even better man and friend. It's not too much of a stretch to say that if not for Ed Gorman, there's a good chance I wouldn't even be a writer anymore. Time and again over the years, when I was having trouble selling and was ready to throw my hands in the air and quit, I'd get a phone call from Ed and he'd say, "James, I know this guy who needs somebody to write a series, and I just told him to call you," or "James, I know this guy who needs somebody to ghost a book real quick, and I just told him you're the man for the job." On two occasions, it was Ed himself who needed a book written in a hurry. He'd sold some Westerns to Zebra but didn't have time to write them. He sent me an outline for a book called THE MAN FROM NIGHTSHADE VALLEY and told me to make it as much like a Max Brand novel as I could. That was no problem, since I'd been a Max Brand fan since I was ten years old, but I quickly read several Brand novels anyway to get in the mood and launched into the writing. The book turned out to be one of my favorites. Zebra published it under the name Jake Foster, with a pretty good cover and the title changed to HELL-FOR-LEATHER RIDER. Since the book's protagonist was a Pony Express rider, that sort of fit, although not as well as Ed's original title. The other book I wrote for Ed was very different, a noirish Old West novel about a man unjustly blamed for a bank robbery returning to the town where the crime took place. Ed's title was THE PRODIGAL GUN. Zebra published that one, again as Jake Foster, under the less appropriate title RAMROD REVENGE. Many years later, when I republished these books under both of our names, I restored Ed's original titles to them. I'm trying to remember when Ed and I first met. It was around 1985, I know that, and I believe it was Bob Randisi who put us in touch. Ed sent me a couple of his horror novels that Zebra had published under the name Daniel Ransom. I loved them: fast-paced yarns, funny in places, and genuinely creepy. I'm not sure Ed was that fond of these books in later years, but I still have a soft spot in my heart for them because they introduced me to his distinctive voice. His horror novel THE FORSAKEN (published by St. Martin's, I believe) has passages in it so poignant that they still get me a little misty-eyed when I think about them decades later. But Ed was one of those guys who could write just about anything. His mystery novels and stand-alone thrillers were all top-notch. He could do excellent house-name books, although he preferred working on his own stuff, and who can blame him for that. But for my money, his best novels are his Westerns. Intricately plotted, tinged with melancholy, full of painfully sharp observations about the human condition . . . We might as well just go ahead and say that Ed Gorman was the best author of Western noir of all time. When I said above that Ed and I "met" in 1985, I mean through correspondence, of course. Ed wasn't a guy who got around a lot. He liked being at home, and he didn't like crowds. We traded emails and letters for thirty years, though, and in the pre-Internet days we talked for hours on the phone. I'm one of the lucky folks who met him in person, at the WWA convention in Jackson, Wyoming, in 1992. Our visit was a short one, but I treasure the memory of it. Forgive the somewhat scattered nature of this post. All sorts of memories are bouncing around in my head today. Ed never ended an email without expressing how much Livia and I meant to him. The feeling is mutual, my friend. We'll miss you forever. Rest in peace, Ed, and our deepest condolences to Carol and the rest of the family. What a cover by Rudolph Belarski. And what a line-up of authors: Max Brand, H. Bedford-Jones, Donald Barr Chidsey, Frank Richardson Pierce, Joel Townsley Rogers, Richard Sale, and James Francis Dwyer. That's an all-star issue of ALL-AMERICAN FICTION. 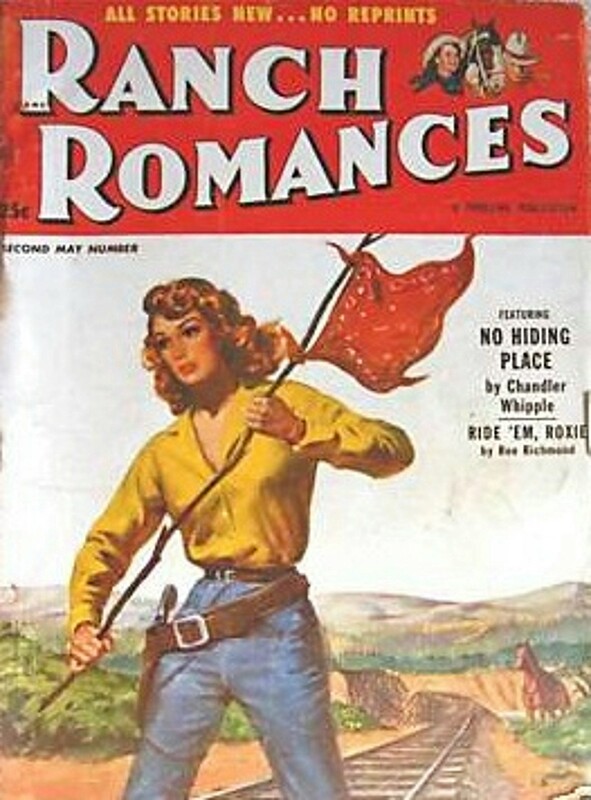 I was sort of in a RANCH ROMANCES mood because I just read a short novel by Livia that could have appeared in that pulp during the Fifties. I'll have more to say about that later when it comes out, but for now I was looking at cover scans on the Fictionmags Index when this one, uh, jumped out at me, I guess you could say. Sam Cherry could paint some beautiful women, and he certainly did on this cover. But what's inside the magazine, you ask? Stories by Walker A. Tompkins, Roe Richmond, Chandler Whipple, Ben Frank, house-name Sam Brant, a couple of authors I haven't heard of, and two female Western authors, Jeanne Williams and Teddy Keller. I met Jeanne Williams at some of the WWA conventions twenty or more years ago and have read some of her novels. Excellent writer. Don't know that I've read anything by Teddy Keller, but I should. Of the others, Tompkins is always good and Richmond sometimes is. From what I've read, the Fifties is my favorite era for RANCH ROMANCES. This novel was published by the legendary Lion Books in 1952. The narrator is New York private eye Barney Glines. A PI named Barney Glines also appears in William Ard’s two Danny Fontaine novels, published about a decade later. I haven’t read the Fontaine books yet, so I don’t know if the character is supposed to be the same one or just has the same name. This novel has a very atmospheric opening in which Barney is in a seedy hotel in Mexico, having come there to kill a man. Someone beats him to it, though, and from there the story backtracks to how and why Barney set out on this murderous quest. The yarn includes a beautiful actress, stolen diamonds, blackmail photos, strippers, vicious junkies, and a particularly brutal murder for which Barney is framed. In other words, all the stuff you need for a good private eye novel. Which YOU’LL GET YOURS certainly is. In the end, the plot is a little too simple and seems to be lacking a twist or two, but the book is fast-paced, the action scenes are very good, and Barney Glines is a likable character. Its strongest aspect, though, is the nightmarish quality that hangs over the entire book, as if it might just be a fever dream rather than reality. One of Ard’s other novels is called HELL IS A CITY, and in this book, New York is pretty hellish. But in an entertaining way for hardboiled readers, of course. The North Carolina wilderness is a dangerous place in 1714. Trappers and traders Axtel Fannin and Jesse Driggs rescue a beautiful young woman and her brother from kidnappers, only to find themselves entangled in a scheme that may cost them their lives. They and their friends will need every bit of their skill as woodsmen and fighters to survive a savage pack of killers driven by vengeance and greed. 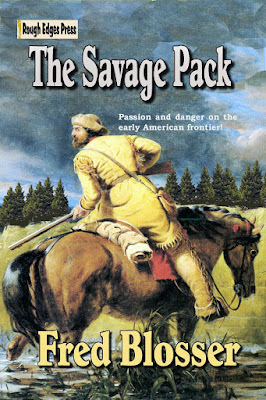 In the tradition of such classic authors of historical adventure as James Fenimore Cooper, Robert E. Howard, and Hugh Pendexter, Fred Blosser spins a colorful, action-packed tale of passion and danger on the early American frontier. 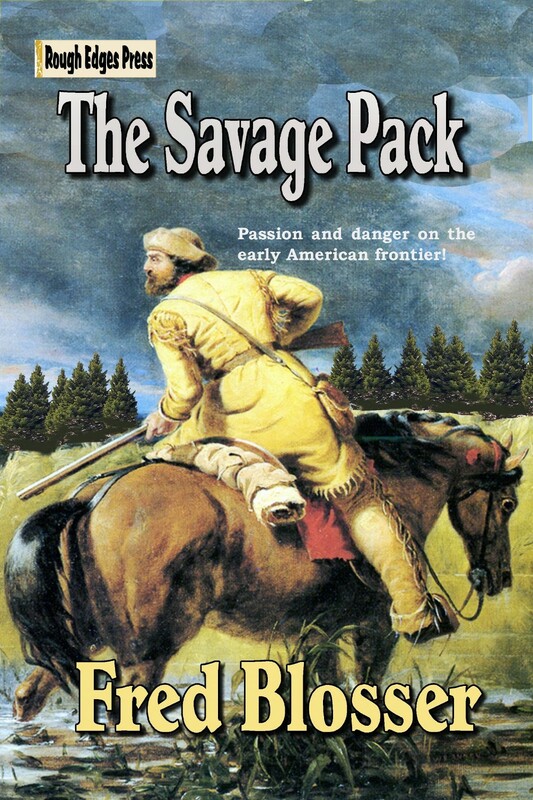 THE SAVAGE PACK is excitement from beginning to end! Town-taming lawman Joe Wiley was once a Comanchero, an outlaw and a killer so fast on the draw he's come to be known as Snakehand. However, an unexpected tragedy leads him to change his ways. Now with his blind mentor and sidekick, the former leader of the Comanchero band, Joe travels from town to town in the West, taking on the job of bringing law and order to the worst hellholes between the Mississippi and the Pacific. It's that job that brings him to the settlement known as Mercury Wells, but what he finds waiting for him there is worse than he ever expected and will change his life again. 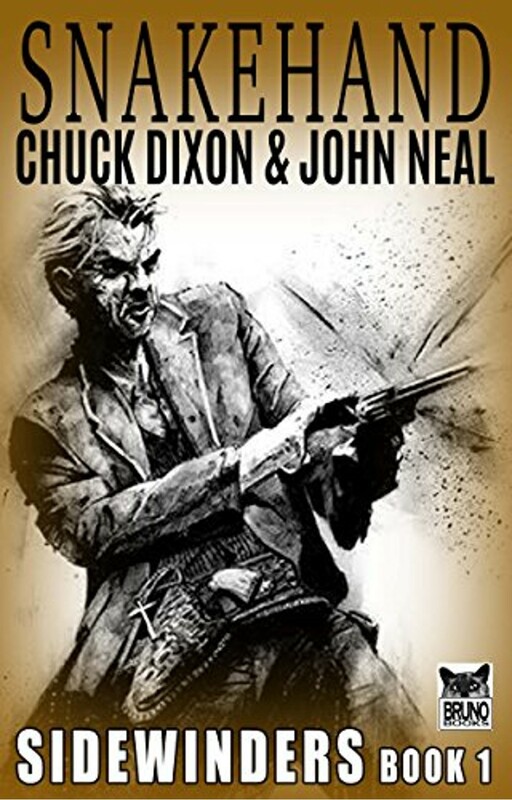 This is the first Western novel by comics scripting legend Chuck Dixon, along with his co-author John Neal, and it's a rip-snorting tale that barrels along at full speed, an action-packed blend of the pulp, the traditional, and the Spaghetti Westerns. 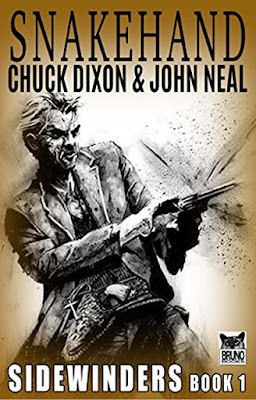 The violence is reminiscent of the Edge books by George G. Gilman and other series produced by the Piccadilly Cowboys during the Seventies, the settings are well rendered, and while Joe Wiley may not always be the most likable guy, he's a fine protagonist. I'm looking forward to the next book in this series. Recommended. This is the one that somehow I had never seen until now. 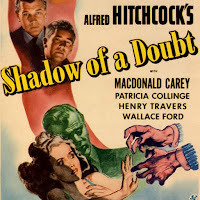 It was reportedly Hitchcock’s favorite of his films, and I liked it quite a bit, too. It’s a somewhat uneasy but highly entertaining mix of small-town Americana and serial killer thriller, as a young woman (the lovely Theresa Wright) tries to figure out whether her charming uncle (Joseph Cotton, who will always be Jed Leland from CITIZEN KANE to me) is really a murderer. There’s a great supporting cast in this one and a lot of humor despite the grisly subject matter. Macdonald Carey strikes me as an odd casting choice for the FBI agent who’s the hero. Wallace Ford, who played the taxi driver in HARVEY, is much better as Carey’s partner. 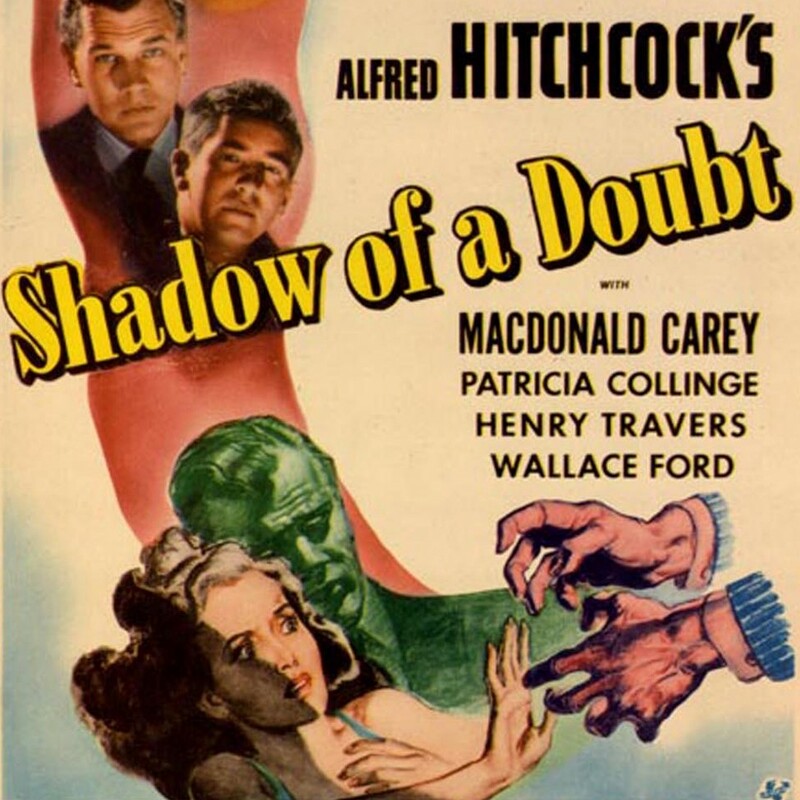 This is one of the few movies I’ve seen where I was really uncertain how it would end, so I think Hitchcock deserves that Master of Suspense label on this film. If you haven’t seen it, you should definitely check it out. I don’t recall when I read my first science fiction story by Robert Silverberg, but it was more than forty years ago, that’s for sure. And I’ve read and enjoyed plenty of them since then. 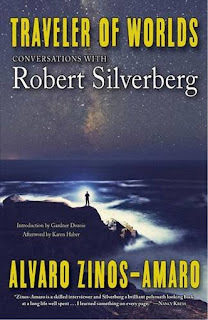 So it’s no surprise that I enjoyed this book-length series of interviews with Silverberg conducted by Alvaro Zinos-Amaro. 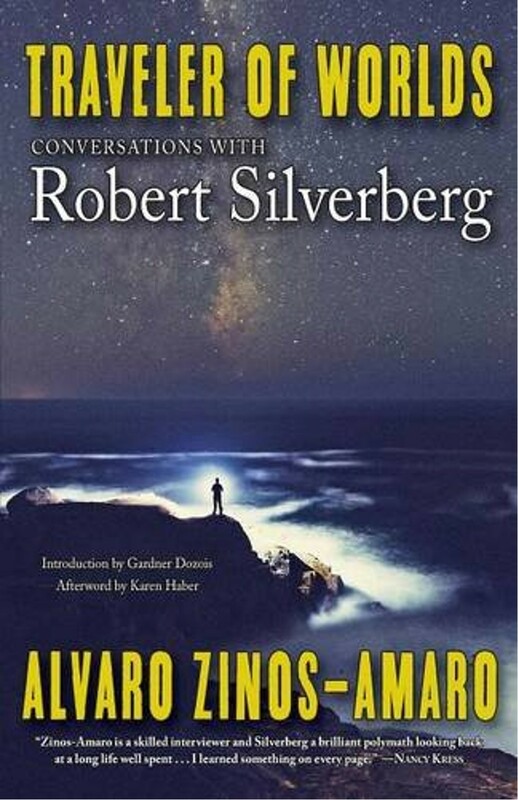 It’s a wide-ranging conversation, focusing as much on Silverberg’s views about art, music, travel, and philosophy as it does about his writing career and science fiction in general. Now, me personally, I would have been fine with a little more “And then I wrote” material, but that’s just me. All in all, this is a thoroughly entertaining volume, and if you’re a science fiction fan at all, I give it a high recommendation. I seem to recall a few years ago that some young SF writer asked dismissively why anybody should read Robert Silverberg. Well, here’s the answer, right here in this book. This scan comes to us courtesy of David Lee Smith, and I really like this cover. I don't know who painted it. The contents are not as impressive--the only authors whose names I recognize are C.S. Montanye, Hal Dunning, and Forbes Parkhill--but for all I know the stories by them and the other authors are excellent. 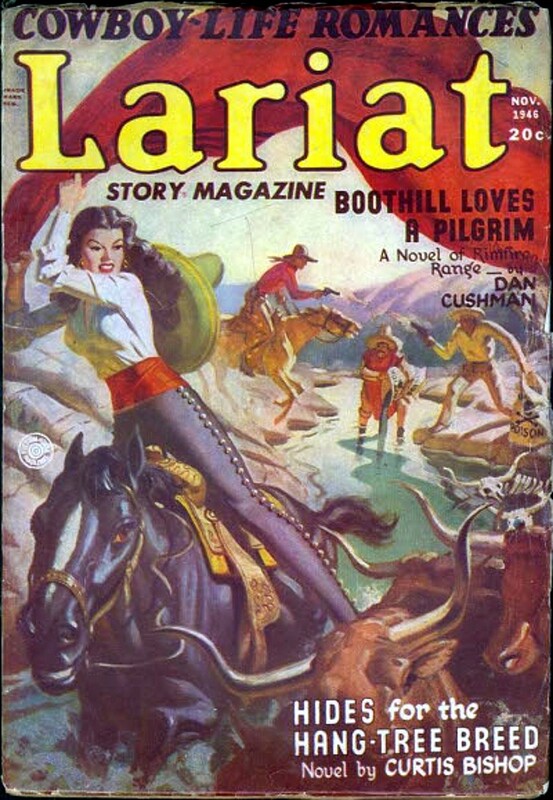 Yesterday I wrote about the lead novel in this issue of one of my favorite Western pulps. 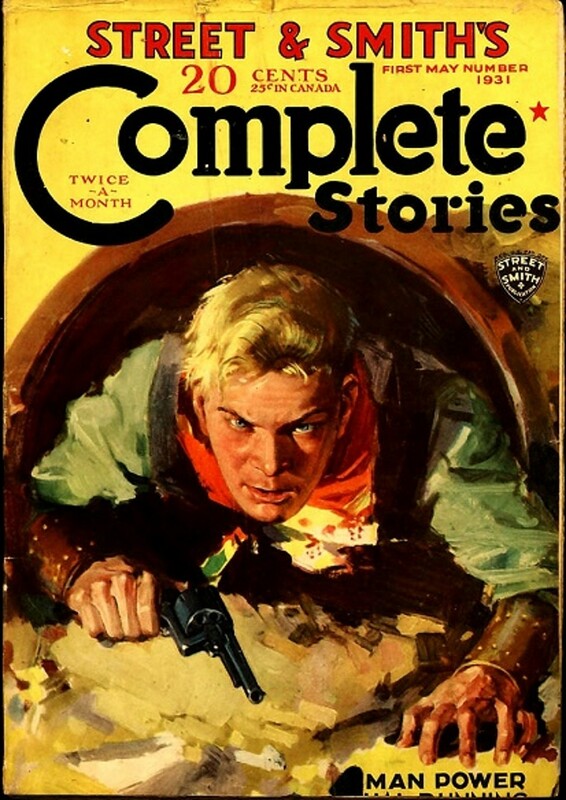 The paperback edition of THE COMSTOCK LODE doesn't include one of the features that made the original pulp interesting: with its historical settings and characters, each issue included several half-page vignettes scattered throughout the lead novel, each with a drawing of one of the historical characters and background on that person. In this issue, these mini-articles feature Brigham Young, Adolph Sutro, Mark Twain, and Al Sieber. Elsewhere in the issue are short stories by prolific Western pulpster Hapsburg Liebe and house-name John M. Easterly. THE RIO KID WESTERN is one of my favorite pulps. I've read probably three-fourths of the Rio Kid novels and enjoyed most of them. 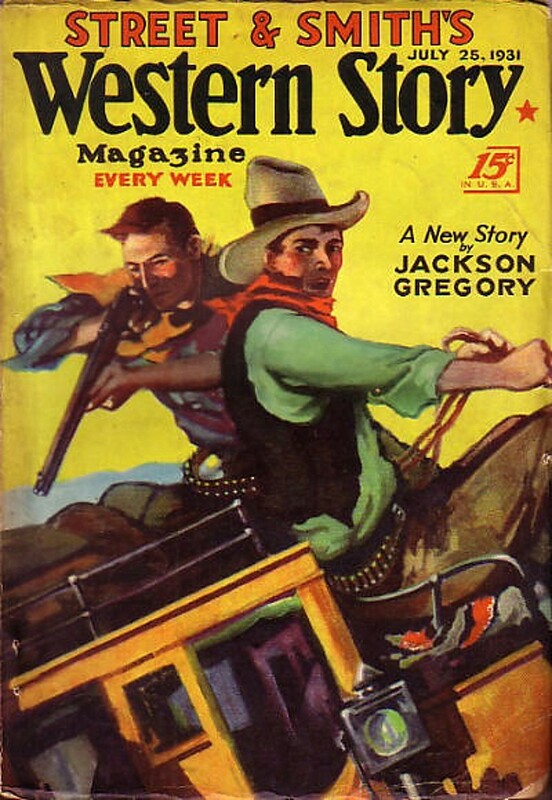 THE RIO KID WESTERN has long been one of my favorite Western pulps. I discovered the Rio Kid character through paperback reprints published by Curtis Books during the Seventies, read many of those, and went on to collect and read quite a few of the original pulps. The Rio Kid is Captain Bob Pryor, former Union cavalry officer, who wanders through the West with his sidekick Celestino Mireles in the years following the Civil War, getting into all sorts of adventures. The “gimmick”, if you will, of this series is that the novels are placed in historical settings and always feature historical characters in supporting roles. THE COMSTOCK LODE is an early Rio Kid novel from the October 1940 issue of the magazine, although I read it in the Curtis Books paperback edition. That's my copy in the scan. The Kid and Celestino throw in with a group of immigrants whose wagon train has been attacked by Apaches and then travel on with them to the silver mining boomtown of Virginia City, Nevada, where the pilgrims hope to find their fortunes. Things don’t work out that way, largely due to the evil villainy of a gang of killers known as the Night Riders (not a very original name for a gang of pulp villains . . . but hey, I once wrote a book called THE NIGHT RIDERS, so who am I to talk?). Real-life mining engineer Adolph Sutro puts in an appearance, as do the Apache chief Victorio, army scout Al Sieber, and none other than former Virginina City journalist Samuel Clemens, already famous as Mark Twain. After a lot of riding and shooting and being framed for murder, the Kid exposes the hidden mastermind behind all the trouble and with some help from his friends cleans out the Night Riders. I think I read this one thirty-some-odd years ago, but I didn’t remember anything about the plot, which doesn’t really matter because it’s pretty predictable anyway. I don’t read books like this for the plot, though. I read them for the same reason I watch B-Western movies: they make me feel like a kid again. Stalwart heroes, despicable villains, and action, action, action. Of course, it helps if the writing is good, too, and it certainly is in THE COMSTOCK LODE. The author, Tom Curry, created the series and wrote more of the novels than anyone else, although other authors, most notably Walker Tompkins, penned some excellent Rio Kid yarns along the way. 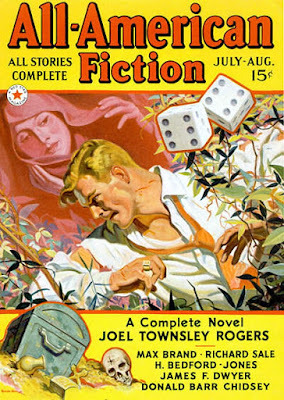 Curry had a long, prolific career as a pulpster. A former journalist, he got his start writing hardboiled crime tales that were good enough to crack the leading magazine in the field, BLACK MASK. By the mid-Thirties he had become a steady member of editorial director Leo Margulies’ authors stable at Ned Pines’ Thrilling Group. 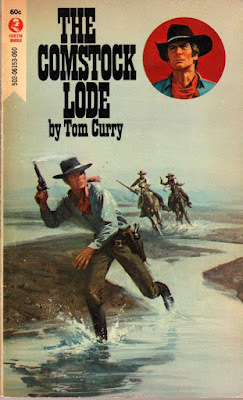 Curry not only created and wrote the Rio Kid, he was one of the regular authors of Jim Hatfield novels in TEXAS RANGERS under the house-name Jackson Cole, ultimately contributing 55 Hatfield novels, the same number as series creator A. Leslie Scott. Curry also wrote novels for the other two Thrilling Group Western character pulps, THE MASKED RIDER WESTERN and RANGE RIDERS WESTERN, along with countless stand-alone novellas and short stories. 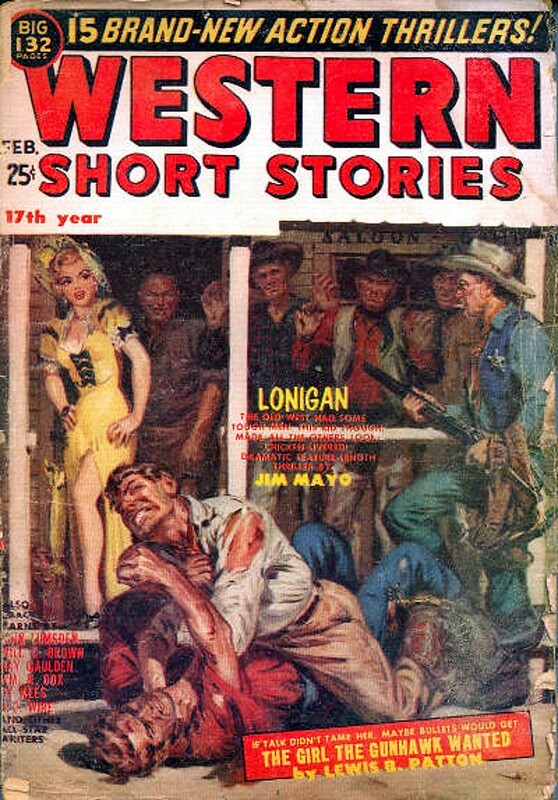 As the pulp era wound down in the Fifties, Curry retired from writing to work in industry, but in the Sixties he returned to writing for Leo Margulies again, turning out several of the Buck Duane novellas that Margulies’ Renown Publications published in the digest ZANE GREY’S WESTERN MAGAZINE under the house-name Romer Zane Grey. After writing so many Jim Hatfield novels, these novellas featuring a lone wolf Texas Ranger must have come pretty easily to Curry. During this period he also ghosted one of the Walt Slade paperback novels for his old stablemate Les Scott, under the name Bradford Scott, and wrote two of the Sundance novels under the house-name Jack Slade, RENEGADE and HONCHO. 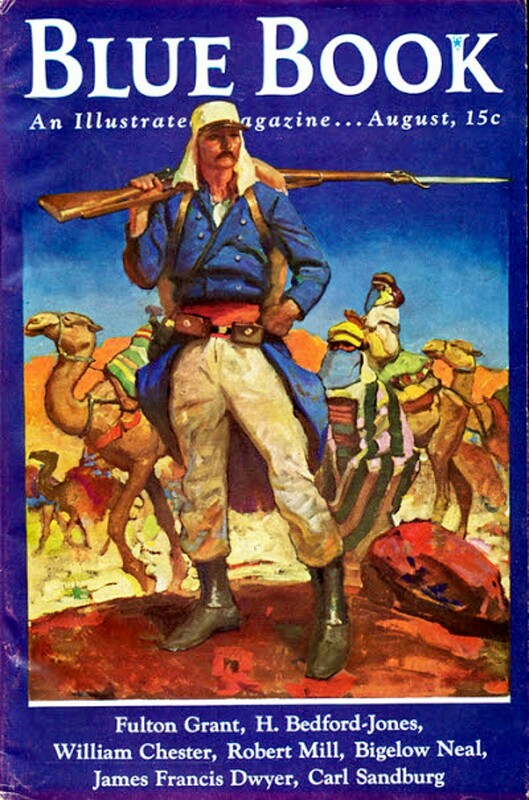 I’ve always found Curry to be a dependably entertaining Western author and am always happy to read his work. Now, as an aside, when I started reading the paperback edition of this novel, I thought it was in really good shape for a book published by Curtis, a company notorious for publishing books that fall apart when you read them. My copy seemed nice and tight . . . but by the time I finished, the glue had come loose and the pages had separated from the cover. If there was ever a company that published more shoddily produced books than Curtis, I’ve never run across it. Even Manor Books from that era hold together better. Despite that, Curtis put out a lot of books that I’ve enjoyed over the years, and as long as the text is all there, I can live with the books falling apart. By this point, it’s almost part of Curtis’s charm. 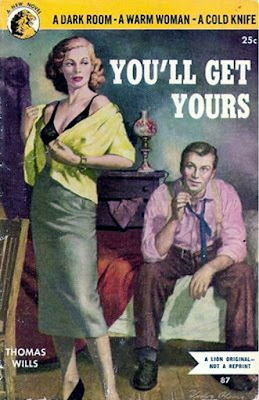 Tomorrow as this week’s Saturday Morning Western Pulp, I’ll have the cover of this novel’s original appearance. 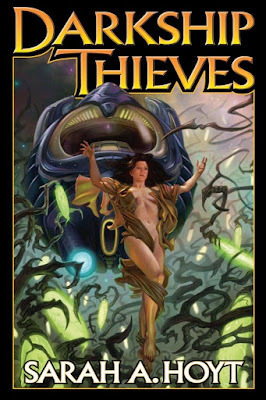 There's a lot of back-story in DARKSHIP THIEVES, the first novel in Sarah A. Hoyt's Darkship series. In the future, genetically engineered and bio-inhanced individuals known as Mules take over the earth, a development that results in a bloody upheaval in which all the Mules are wiped out or forced to flee from the planet. Earth winds up being ruled by a consortium of billionaire aristocrats known as the Good Men. There are rumors that the surviving Mules have set up a colony somewhere out in the Solar System, but nobody knows for sure if that's true. But there are powertrees growing in space, some sort of bio-construct created by Mule scientists. They grow pods that are harvested to produce power back on Earth. Got all that? Because it's in place before the plot in this novel even gets started. The narrator/protagonist of DARKSHIP THIEVES is Athena Hera Sinistra, the wild, spoiled daughter of one of the Good Men who rule Earth. An apparent mutiny aboard the space cruiser owned by her father forces her to flee into the powertrees in a lifepod. I say apparent because this is one of those books where almost nothing is what it seems to be at first and the plot twists and revelations come at an almost constant clip all the way through. Athena is rescued by a darkship from that semi-legendary Mule colony and taken back there. The darkships, hard to detect as you might imagine from the name, are piloted by genetically enchanced former humans who steal the power pods for the colony. Athena winds up in all sorts of intrigue and danger, as well as a romance with her rescuer, who's been genetically modified to have cat-like vision and reflexes. It's all even more complicated than I've made it sound, but Hoyt makes it work, largely because her two main characters are so likable. Athena isn't exactly an unreliable narrator, but she is on the eccentric side. The plot moves along briskly, the world-building is excellent, and this novel comes to a satisfactory conclusion while still leaving the impression that there's a lot more tale to be told. There are three more books in the series, and I suspect I'll be reading them all. Recommended. I don't know, the scene on that cover doesn't look very romantic to me. But it is eye-catching, and that's what pulp covers were for. The authors inside are mostly the pseudonymous regular suspects: Robert A. Garron (Howard Wandrei), Jerome Severs Perry (Robert Leslie Bellem), John Ryan (Roger Torrey), Wallace Kayton (Edwin Truett Long), and Eddie Sommers, whose only credit is his story in this issue, so that's probably not his real name, either! 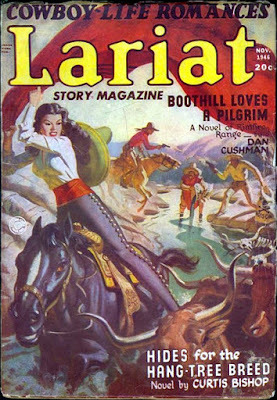 Almost every time I see a cover from LARIAT STORY, I think, "I want to write that story!" This one is no exception. Someone beat me to it, of course. Authors in this issue include Dan Cushman, Lee E. Wells, Rollin Brown, Ben Frank, Richard Brister, and John A. Saxon.